A little work, but most definitely worth it. Keep this recipe in mind as the weather turns colder and/or you’re stuck inside on a nasty, cold rainy day. This one takes some time – not all active time, but time nonetheless. But it’s so worth it…. Company-worthy, actually. If you’re really stuck inside (like a snowstorm) include that on the menu too. Why not?! And invite a few relatives or friends over to enjoy the repast. Pop a couple bottles of red and you’re set for a wonderful evening. Making pasta is not a difficult thing. Italians have been doing it for quite some time with a great deal of success, so people say. One of the main sticking points in making pasta is the flour. Many recipes call for “00 flour” or a combination of 00 and durum wheat flour. 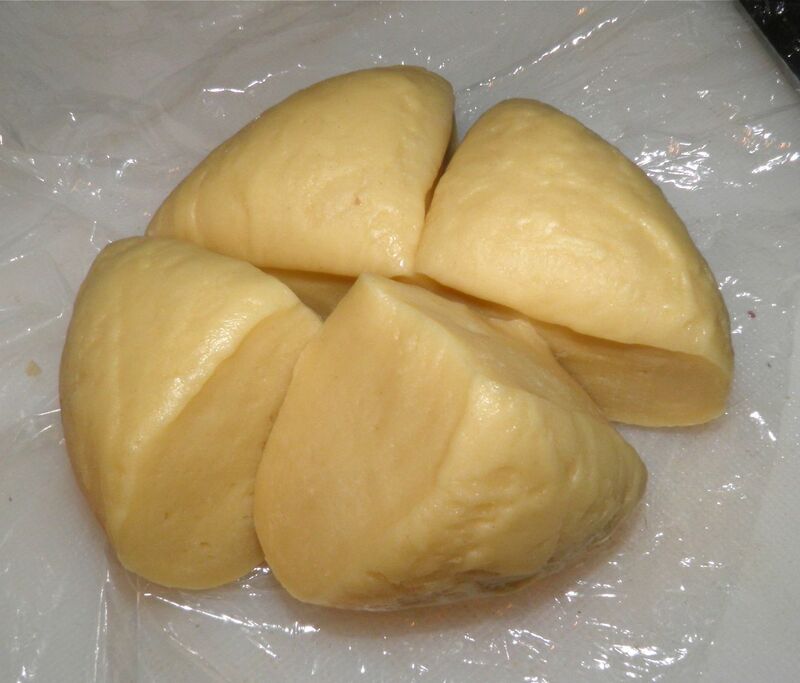 00 is very fine ground flour, and is not inexpensive. Durum is a stiff wheat flour you can get at the bulk food store. If you tried to make all durum pasta you would have a very difficult time of it in the home kitchen. Very hard to knead. Luckily you can make perfectly acceptable pasta with plain old white flour. I always do and it turns out just fine. I do like to use unbleached flour, just because it’s a little less processed. Any recipe that calls for 00 can have plain white flour substituted with hardly any ill effects. Purists might know, but not the rest of us. 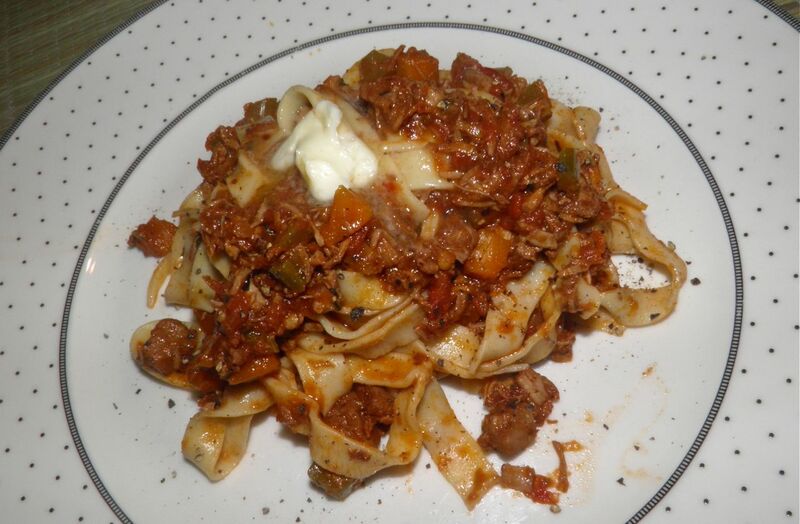 Since there’s two recipes today, I’m keeping my blather short and getting right to the heart of the matter – the food! 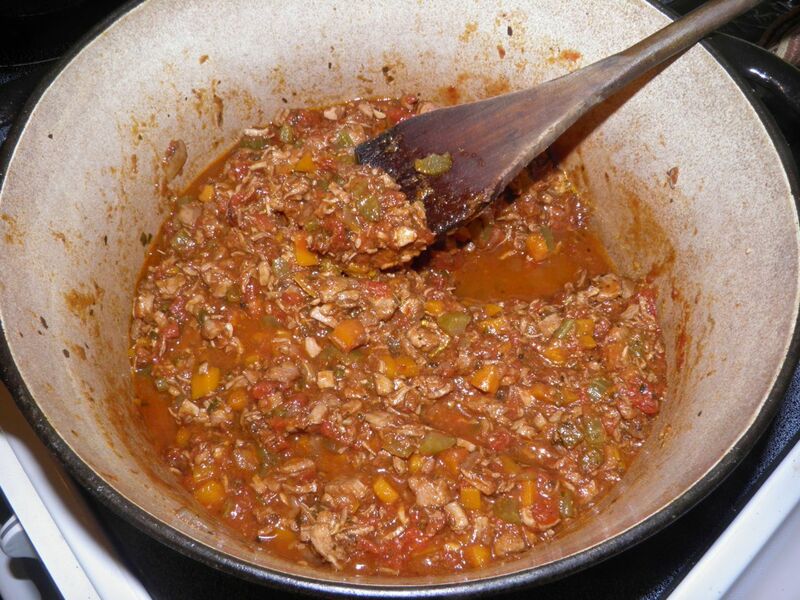 The ragù just before covering to simmer. The ragù after cooking for 2 hours. Heat 1 tbsp of oil in a Dutch oven pot. Add the pork and cook until the pieces start to brown. Remove and reserve. Add the other 1 tbsp of oil to the pot. Add the soffritto (onion, carrot and celery) and sauté until the vegetables start to brown slightly, about 5-6 minutes. Add the garlic and sauté for a further minute. Add the wine to the pot and scrape any of the brown from the bottom of the pan. (the brown is called “fond” and has a lot of flavour.) Then add the tomatoes, oregano, basil, red pepper flakes, salt and pepper. 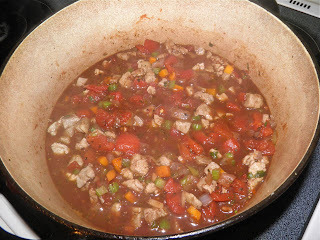 Bring the mixture to a boil, reduce the heat to low (simmer) and then add the pork pieces. Stir well, cover and cook for 2 hours. Stir occasionally to ensure nothing sticks to the bottom. 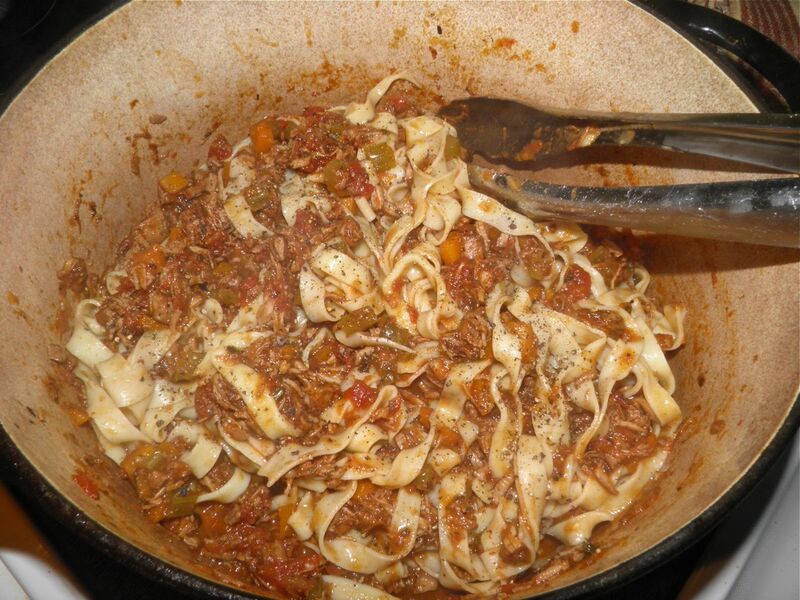 While the ragù cooks, make the pasta. See recipe below. At the end of the 2 hours check the mixture. It should be nearly dry. Mix together the tomato paste and water and stir in. Bring back to a simmer. Remove from the heat and stir in the butter. Then add the cooked pasta. See the end of the pasta recipe for final directions. and once you make pasta, you'll make it a whole lot more! Mix the salt and flour together in a bowl. Break the two eggs on top and whisk with a fork. Continue to whisk slowly incorporating the flour. When you can no longer incorporate with a fork, move the dough to a board and knead it together with your hand. You may need a little more flour, or maybe not. The dough must be pliable but not sticky, and not too stiff either. Knead for about 5 minutes or a little longer to make a smooth ball. Wrap the dough in plastic wrap and let sit to rest for 30 minutes. After resting the dough will be even more pliable. Cut into quarters. 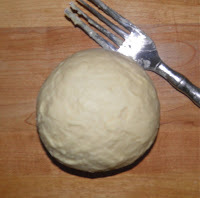 Roll each piece of dough out either with a hand crank pasta machine, or with a rolling pin, and cut into linguine. If you have a pasta machine the cutter will be an attachment that comes with your machine. If doing it by hand – which isn’t impossible for even a beginner – dust each rolled sheet with flour so it doesn’t stick to itself, roll up individually and then cut with a sharp knife. 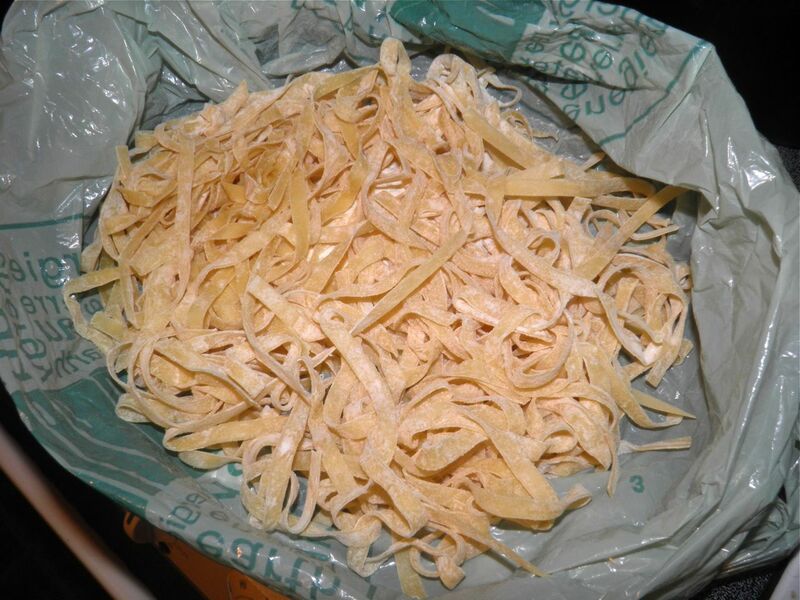 Toss the cut noodles with a little flour to prevent them sticking together. Cook the pasta in salted water for no more than 3 minutes. Drain and then add to the ragù. Toss well and serve.